The history of the Bava Family starts in Cocconato, a village that rises steeply up the hillsides of the Monferrato Astigiano. The Bava Family has grown grape vines in this territory since 1600 and in 1911 in the very same area the family built their first wine cellar. Since then, over a hundred vintages have gone by, with four generations following one another. 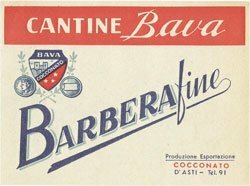 The best Bava Barberas are renowned in the world thanks to their high quality. Today, the family estate extends in Monferrato and Langa, with fifty five hectares of vineyards and twenty hectares of natural fields and woods and fifty-five vineyards, cultivated with the same awareness, care and attention of the olden times resulting in a sustainable agriculture with a reduced environmental impact. Walking along the Bava vineyards, you will notice the grass clippings and the prunings used as natual fertilizers, the poles, all strictly made of wood coming from renewable forests or grassing between vine rows, which not only helps prevent soil erosion, but also serves as proof that no hebicides are used.